Having an opportunity to email back and forth with Hal Hefner has helped me see beyond various stereotypes of art, and artists for which I am grateful because so much joy is lost when approaching the world as if stereotypes are facts. As a perfect example of this, the art of Hal, as much as the artist, is largely indefinable in simple terms because a simple explanation of either fails to tell a complete story. Hal is a self-proclaimed rebel and that’s apparent in his art work, but also in his communication and demeanor. In our emails, he is calm, cool, humble, grateful, and positive (despite a lifetime of rebellion in artistic and humorous forms).These are not common traits, to be bundled together, among artists, especially the positivity and gratitude, but it was refreshing and led to this interview being a sort of open book about Hal himself. His success, positivity, humility, eagerness to keep learning, and a variety of artistic styles that span the length of various scales, prove that Hal Hefner is a rebel at heart. What follows is our Q&A. Q&C: What was your first piece of rebel art? What was your first rebellious act? Rebel art. It feels like all my art, all of my life was rebellious in one way or another. I’ve always been drawing stuff that made a few cheer, others ignore, a few squirm and a bunch enraged. I like it that way. I have always preferred art that makes you think over art that makes you say, wow, that’s beautiful.” I was a rebellious kid at an early age, so it’s hard to pinpoint my first act. I had a lot of trouble following authority as a kid, growing up in a small, conservative town in upstate NY that didn’t reward children for thinking for themselves and questioning everything. I was always an artist too. I realized that I could make others laugh with my art. Mocking authority figures started at an early age, around first grade or so. My first pieces of rebel art that made an impact were drawing cartoons of various teachers that hated me and made my life hell, in 3rd and 5th grades in particular but reached a pinnacle in junior high–where my cartooning prowess became known all around the school. I would often depict these teachers or classmates as unflattering caricatures or monsters or having orgies with each other–or animals. This was my artistic “F.U.” to the conservative Republican vibe of authority and hypocrisy I was rebelling against, without even really knowing I was rebelling against it. It was really my way of channeling eighth grade aggression. Channeling real life anger, frustration and aggression into artistic output is definitely the related tie that binds these tidbits together. It still drives me today as well. However, my best artistic piece of rebellion as a teen came on the night I graduated from High School when I drew the Joker (Jack Nicholson’s Joker) in front of my school screaming, “This town needs an enema!” One former Mohawk police officer, still reminds me of it frequently on Facebook to this day. Q&C: Did your parents or family see your entering into art as an act of rebellion? HH: No. I don’t think they saw it as rebellion. They just didn’t understand art at all. My dad was a sports guy, coach and former sports reporter. He didn’t know what to do with me. I wowed the family at an early age with my art skills and both my Mom’s and Dad’s side of the family supported me from the beginning. Strangely enough, they did not dispute the fact that I was destined for a life of art from the age of 3 onward and were the main source of my art supplies and books and comics that inspired me growing up. Q&C: When did you first see the movie ‘They Live?’ When did it occur to you to create your CONSUME series, inspired by this film? 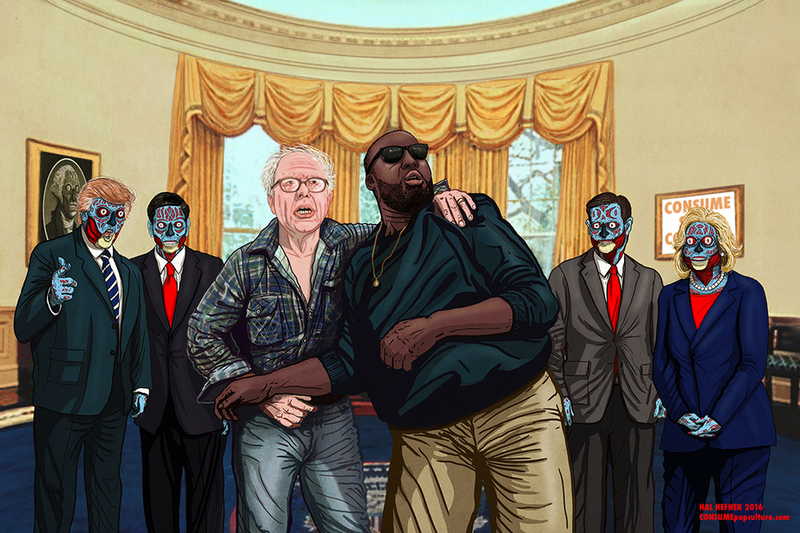 HH: I saw THEY LIVE, on my buddy Mark Brough’s couch on a Saturday afternoon in early April of 1989. We watched it on VHS that we rented from the town’s lone video store. When I watched it, I immediately loved it and began to envision Madonna as one. She was the first one I imagined as an alien because at the time she was the epitome of consumerism and the alien agenda–still is. I finally revisited this concept in January of 2015 after being disgusted by Kim Kardashian and it just felt natural to turn that Paper Magazine cover into a fun piece of stylized propaganda art that mocked her and her narcissistic ways. Then once I released Kim to the world, the rest is history–it took off and everyone asked for more. So out popped Bill Cosby, Tom Brady, Ronald McDonald and Steve Jobs. Then people started really paying attention and the same thing happened once again just like high school–people found my art funny and amusing and rebellious and then a following began to grow. It was and still is a humbling experience I am so grateful for. Q&C: Do you have any work in progress images, for illustrations that are now finished and published, that you’d be able to share with us? HH: Here’s an image I created of the Royal Family, right after baby Charlotte was born. IMAGE 1 – This is how all of my images begin, with a really solid line drawing. I have a very specific color palette I use so the line drawing almost always begins in a dark blue. 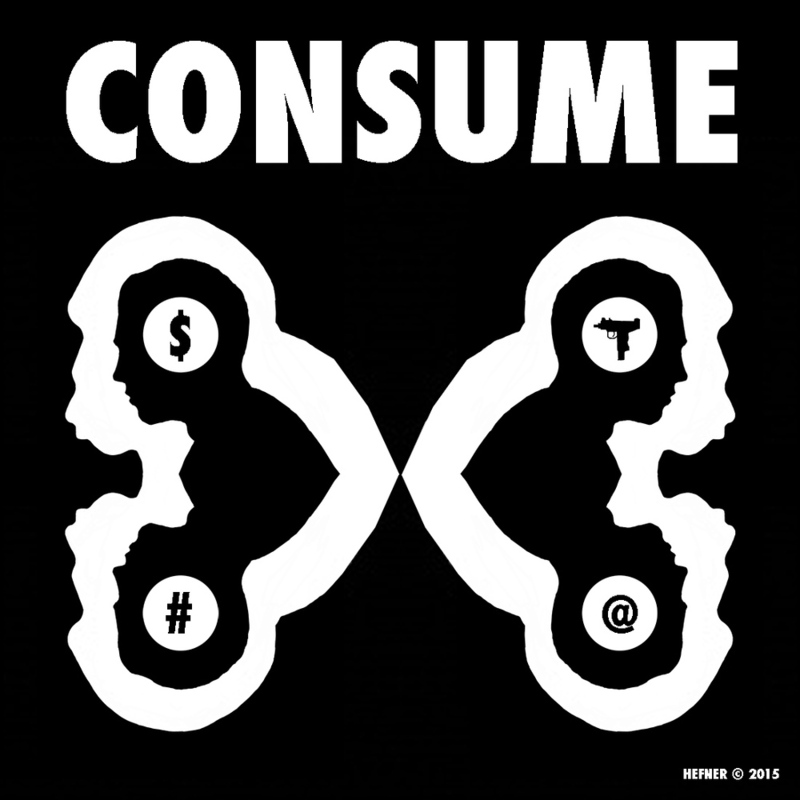 I also lay out the image completely by placing the word CONSUME in its rightful place. IMAGE 2 – Taking into consideration, the specific red and blue color palette I use, to ensure vibrating colors, I begin to color in the image. I specifically start with colors in the RED range that begin with the values 100% Yellow and 100% Magenta. For the blue spectrum I always use 100% Cyan. In this particular image, I cloned the pattern from one of Kate Middleton’s dresses and then manipulated the colors to reflect my palette. IMAGE 3 – More coloring takes place. This time I am focusing on creating a very vibrant blue so that it will pop off of the red. The color of Kate’s hair will eventually set the tone for the rest of my colors in this piece. IMAGE 4 – The coloring is finished and evenly balanced. All the details are completed. IMAGE 5 – The last part is when I add shading and highlights to give it form and volume. I typically go in with a black/blue color on a new layer and then adjust the opacity once I’ve filled in the area I want to be shaded. 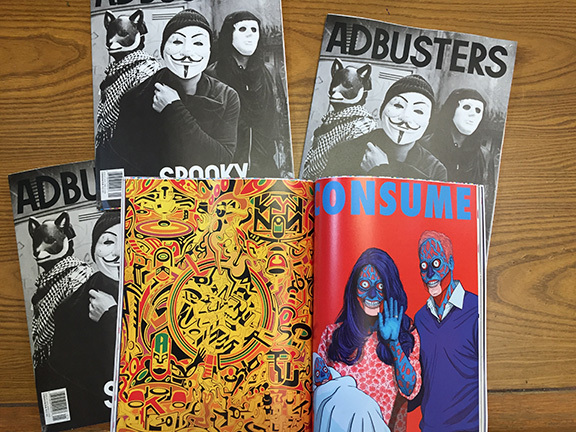 IMAGE 6 – The image in publication in ADBUSTER’s magazine. Q&C: What percentage of your process involves physical media and what percentage involves digital media? HH: I typically start with a sketch in my sketchbook to get the idea out. The proportion, and image framing are usually awful at this point as I’m more focused on the idea. Once I have my idea, I grab a reference photo to work from because the likeness of the intended character is crucial. Then I redraw it in Photoshop to begin the final line drawing that I can color and complete. Since I have a special graphic formula for the CONSUME series, I generally use Photoshop when making these images, as the process is pretty natural – beginning and ending with my Wacom monitor to draw on. However, just because I work digitally does not mean that I do not know how to paint. The majority of my early artwork I created in my career for Role Playing Games, books and magazines was all traditional in either watercolor or oil or acrylic. I love to paint and at heart I will always be a painter and an artist. Digital tools are just that tools, so any artist worth a grain of salt should be able to draw and create with anything—they are just tools. Q&C: Do you use cameras to complete or post your work? If so, what do you use and why do you use it over another camera? HH: No. I use cameras for photography only at this point in my life. My art is finished digitally. For me, it’s all about completing my art then saving it in various sizes and resolutions -for display on different websites and social networks – so that I may release it to the world. However, I do incorporate my photos into my work occasionally. Q&C: Describe your ideal studio… Is it large, well lit or dark like a cave? Do you share this ideal space with other creative professionals? Where is it? What materials are there? Is it mobile? HH: Ideal studio…I have a pretty damn good one as is, that is almost church like in its triangular shape. It’s my sanctuary where I have created my best work over the last ten years. Though I do love it, if I had to create an ideal studio, it would be huge and filled with toys to create art with. I love having a screen printing press in my office but you really need a lot of space for that so if I had more space the first thing I would buy is a huge printer, that printed large format art, an 8 color printing press to make shirts and prints. I have always wanted to have skylights to provide the right amount of natural light every day to work with. It would also be great to have a green screen set up where I could shoot videos often without having to set up and tear down every time. Other than that I really can’t think of much else I need that I already don’t have. Q&C: As an artist, what things can you not do without? HH: Tools. Every artist needs tools to create with. From paint brushes to pencils to Photoshop. The tools I need to create then distribute my art to the world are extremely important. Education. You need to understand what you are drawing in order to create it. Education takes many shapes for an artist, mostly in the form of experiences. There is technical education in how to draw and the techniques to see form, volume, lighting and proportion that are invaluable for artists if they intend to forge a successful career. Education can be from a school, from a book from a video tutorial or just learning from your own failure. For an artist, education never stops. The need to practice never stops. Reference. Reference photos and other artwork to inspire my projects are so important. You can feel the difference when something really reflects its source image and for what I do is important in pulling off the concept. Q&C: What lesson has positively impacted your art more than any other lesson? HH: Well there are so many things but if I’m talking art lessons, I’m thinking Color theory and figure drawing. Without those foundational classes in art school, I couldn’t do what I do today. What I find that was most helpful is uncovering that these were instinctual traits I had and the proper lessons showed me how to tap into them. Now I do it subconsciously without having to think much. For color theory it’s all about contrasting colors and for figure drawing it’s all about taking my time, starting with a good gesture drawing and building with shapes. Best art lessons I have ever learned! Q&C: Do you work for yourself, for a different company, or a mix? Through CATMONKEY, I consult for various companies – doing: art, design, production, and strategy – typically for fun and engaging marketing campaigns for the entertainment industry. I’ve worked on some really amazing properties over the last few years, such as: The Martian, X-Men Days of Future past, Duff Beer, Darksiders 2, SyFY Channel’s Defiance, and Mr. Peabody and Sherman. Q&C: The business of art has almost every appearance of being fickle and inconsistent, what personal, artistic, and business practices do you have to buoy you through the tides of artistic prosperity? HH: I stay hungry, humble, smart. I only like working with people that are hungry, humble and smart too. I just stay level headed, appreciate the success, learn from the failure and move on. Praise and criticism are both fleeting and should be taken lightly. Obviously it’s great to be praised for your art but with putting yourself out there, always comes criticism. The dawn of the internet gave birth to the trolls and they are in large numbers everywhere. When you learn to ignore or laugh at the trolls that is a wonderful thing. I also don’t waste my time with every opportunity presented to me as most of them are garbage. I carefully invest my time in the right ones after I do an evaluation of the source. I keep pushing myself to do new things creatively too. This makes it easier to push onward and break any stagnation or boredom. I’m an artist 100% of the time I just apply it in different areas for different companies. I’m always constantly trying to learn from what others are doing too. Q&C: Do you have a project idea that you’re excited to begin but haven’t started it yet, perhaps because: the idea is still formulating, you haven’t had time, the idea is too personal, there isn’t a market for it, it’s too large or too small, out something else altogether? HH: I just started a new series inspired by George Orwell’s Animal Farm that I’m working on now. Can’t wait to release it to the world. The Serpent Seed is another project I have in the works that has been brewing for quite some time and is a fun Solarpunk Social commentary on our future, technology and the reflecting of our current culture. This one has everything from comic books and animation tied to it as well as alternate reality games and virtual reality. Cannot wait to reveal all of the new stuff in the works for this as well. Q&C: Your CONSUME series, for which you have rightly garnered acclaim and notoriety, is a drastic departure from some of your earlier, detailed illustrations. Your skill as a renderer is hidden in the CONSUME series, and yet your selection of palette and style clearly represents artistic discernment. What can you say about creating art that gives the appearance of being more free form? Is this even an accurate characterization of the CONSUME series? HH: For me this was an exploration in restraint. My earlier work as you mentioned was very painterly and semi-realistic. CONSUME is all about breaking those chains of painting, loosening up the style and giving myself a set of color theory based rules designed to induce color vibrations. Also incorporating an element of design and typography is key to this series. Q&C: Why did you choose a simplified rendering style? HH: Like I mentioned above, I wanted to break away from the chains of details and instead do more with less and rely on color and linework rather than painterly rendering. It was liberating myself from my own style and the notion that every artist has to draw the same way ALL of the time like they scared us to death with in the 90’s in art school. “If you don’t have a specific style, you won’t get repeat work”–they said. Well breaking rules has always worked for me so I decided to give it a go. Q&C: What prompted you to add more detail to the Flint, MI CONSUME? 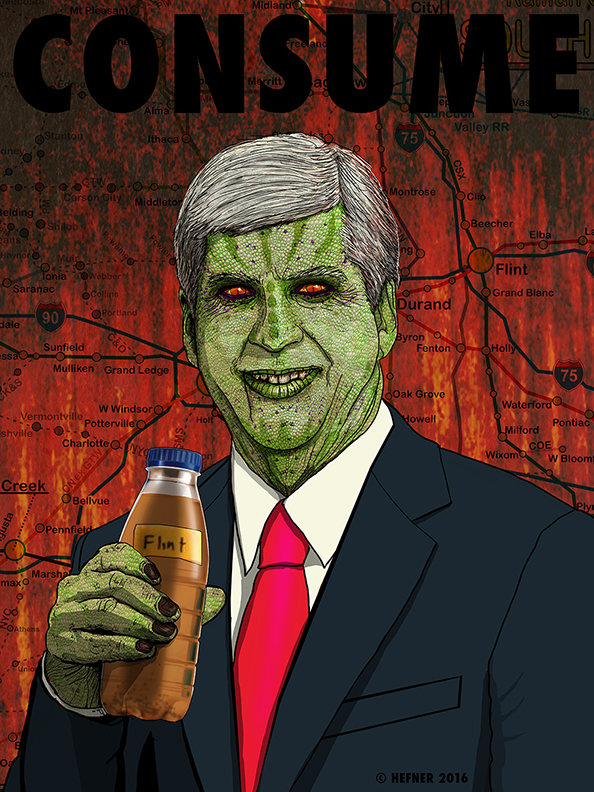 HH: A desire to break away from the They Live imagery and explore a more fear based conspiracy theory of the Reptilian Agenda. I wanted to add texture and more colors. Again rebelling but now against my own rules that I followed for a year or so. This was a fun one and I’ll be doing more like these. Q&C: Some of your strokes for the character outlines are visible, was there a reason to create this, and does it relate to the raw aesthetic for the loud and reduced palette? HH: That’s just the way I draw. It wasn’t something I thought about that much. It was just instinct. Q&C: As an artist, what question would you ask the readers, and people who view your work? HH: Do you think for yourself? That’s ALL I want people to do. If they hate it, fine. If they love it, fine. If I have gotten a response from you, I’ve succeeded. Your opinion does not matter, it’s just the fact that you are actually thinking. What originally drew me to Hal’s artwork was its simultaneous references to consumerism (not unlike the Guerrilla Girls taking on sexism), a decline in political mores, and a silly pop film hiding useful message (‘They Live‘ on IMDB, it was also a highlight of my youth and one still referenced on family phone calls). He’s a prolific artist who’s being viewed around the world. My name is Hal Hefner. I’m originally from a small town in central New York, called Mohawk, named after the mighty Native Americans made popular in James Fenimore Cooper’s, The last of the Mohicans–which took place in that area. I have always been an artist since the moment I could contemplate my existence as a small child. With that artistry has also come a rebellious streak as I always thought for myself and questioned everything. … I was trained as a fine artist at the Munson Williams Proctor Institute of Art prior to getting my bachelor’s degree in Illustration from the Rochester Institute of Technology where I learned the craft of digital art and design from some incredibly talented professors. In 1999, I moved to Los Angeles and began working as a cartoonist and designer for various publications, design agencies, brands and companies. … While working with several amazing companies including Heavy Metal Magazine, Fourth Wall Studios, Ignition Creative and Ridley Scott’s company, 3AM I got to work on some amazing properties including Heavy Metal’s first Webcomic Gates in which I wrote and illustrated. In addition, I got to work on the meta content for X-Men Days of Future Past Film and the award winning film the Martian. 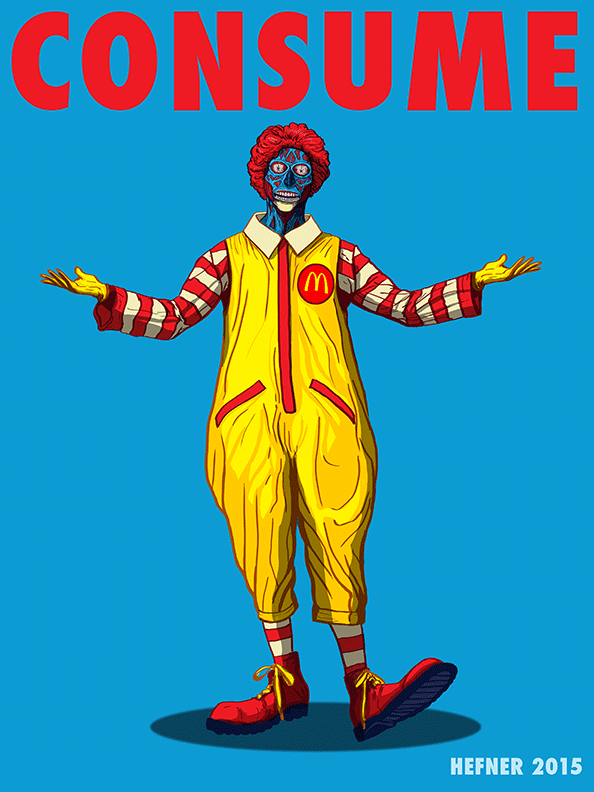 … In January of 2015 I tapped into my rebellious nature once again and applied it to my art with the CONSUME series which was inspired by the 1980’s cult classic by John Carpenter’s, They Live. At its most basic level, CONSUME is a social commentary on greed, political corruption, narcissism, materialism, consumerism, hatred & bigotry. From here things took off and my work was shared millions of times around the internet and around the world. If you have any questions for Hal, or have work you’d like to submit for a critique, leave a comment below!! Look for the article early next month!